Complete the traditional look of your son with this party wear 3-piece set by ahhaaaa. Featuring an eye-catching design, this kids dresses set is also extremely soft against the skin, courtesy the fine cotton fabric. The sherwani handcrafted and embroiderd with moti, gems dabka, zari and zardosi. Club this dhoti kurta for kids with mojaris to perfect his traditional look. These boys ethnic wear comes with 1 Sherwani, 1 Dhoti and 1 Pyjamas. You can put the dhoti or pyjamas on as per the child's comfort. This kids clothing for boys are available in different color Firozi(Sky Blue), Gold and Pink. Our goal is to bring your children close to Indian culture. Our firm is highly involved in manufacturing and we are the specialist in kids wear for boys. 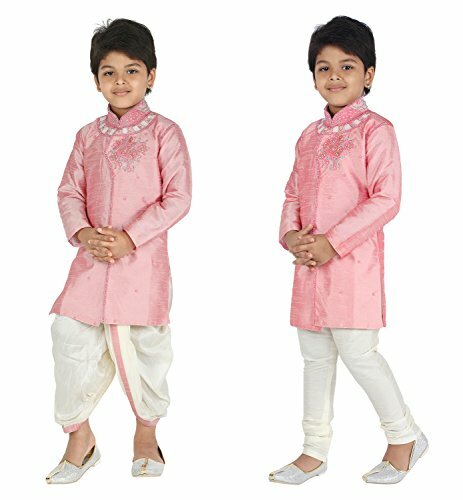 Here you can find a wide range of kids clothing for boys in kids ethnic wear which includes sherwani, indo western, kurta pyjama, dhoti kurta, angrakha set and lot more. Occasion :- Casual, Festive, Ceremony , Party Wear , All Function wear .Made from a rich quality material and perfectly designed for comfort. Give your little boy a perfect look for any festivals, marriages, temple visits or other special occasions your celebrate with your family. For viewing our complete store of Ethnic, Casual and Party Wear, Please click on "Ahhaaaa" in Blue above the title. If you have any questions about this product by ahhaaaa, contact us by completing and submitting the form below. If you are looking for a specif part number, please include it with your message.